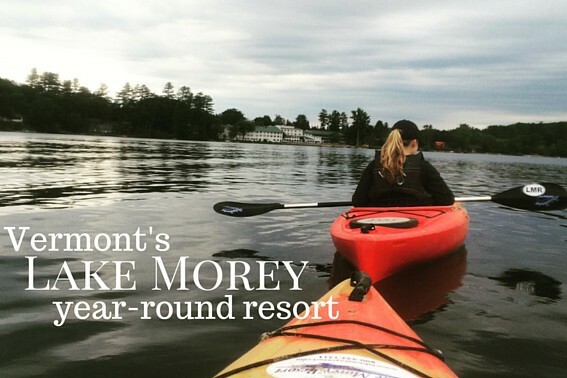 Families looking for a scenic getaway with plenty of activity options no matter what time of the year need to look no further than Vermont’s picturesque Lake Morey Resort. Sitting lakeside, this family-friendly lodging option overlooks 600-acres of beauty. Lake Morey offers up a heaping helping of the great outdoors and activities at the level that suits your tribe best. My family stayed here during the summer and the Weaver family visited during the winter. Here is what we thought of this vacation spot in the New England outdoors. 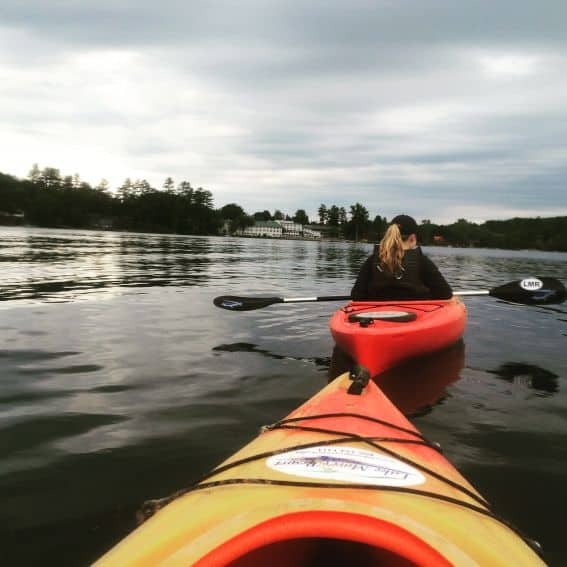 Vermont is a breath of fresh air to those used to more crowded areas, and it is filled with the opportunity to get outdoors and do the kinds of activities that fit your group best. Most activities are included with your stay here. Motorized options can usually be enjoyed for a small fee with a notification to one of the staff members. 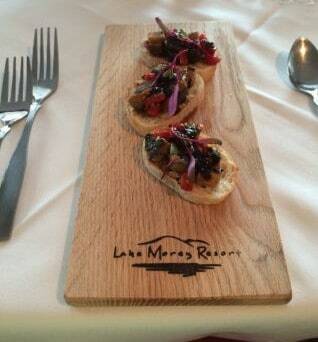 Meals are served on-site in a lovely dining room with a view of the lake. Guests can step out onto their patio to experience it even closer, or even dine out there if the weather permits. The staff is very accommodating and works hard to assure needs are met. There are a variety of kid and family-friendly activities during the day and early evening so that you’re not always scouring for things to do on your own. On one night, families can enjoy a movie at the resort; on another night, families can play a group game, participate in a dance-off, video game contest, or even make a craft. The plethora of smile-inducing activities, the fact that just about everything needed is right on the property, the opportunity to head off to nearby hiking or other off-site activity if you so desire, as well as the ability to spread out in their large, well-furnished rooms make this place a must-consider for your next family vacation. Our stay here during the summertime was filled with the opportunity to do just as we wanted at the resort. Our room had a beautiful view of the lake, so the scenery itself was always a source of calm and beauty. It was wonderful to be able to spend time by or on the water, and really feel like we had escaped. As far as activities, we had the option to hike, bike, fish, swim in either in the indoor pool or the lake, kayak, canoe, water ski, wake board, tube, paddleboard, or walk on the dock. There was also a guided boat tour on the lake, and the opportunity to enjoy games like tennis, volleyball, basketball, and horseshoes. Almost all of these activities were at no cost or a nominal charge, so it was great to not be constantly putting charges on our room while we were there. It was also not crowded, so we did not have to wait for a lot of the activities, which is important when vacationing with kids. There was enough to see and do that we did not feel the need to leave the resort for the few days that we were there. In addition, we were able to eat our meals right on site which was a great convenience. Stunning scenery, the sounds and sights of nature at its finest, enjoyable activities, and the convenience of most of what you need right on the premises made this a wonderful choice for families of all kinds looking for a great vacation destination. 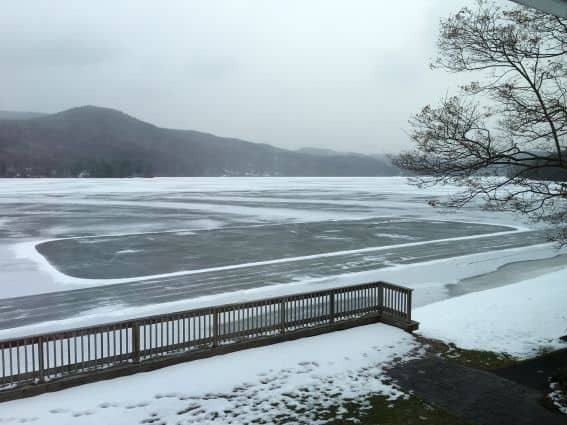 Should you be looking for more of a winter getaway, rest assured that Lake Morey Resort is perfect in the cold too. The lake freezes over completely in the winter and becomes a winter haven for all sorts of recreational activities. Our family (myself, my husband and our two kids, ages 2 and 7) spent a January weekend at Lake Morey Resort. 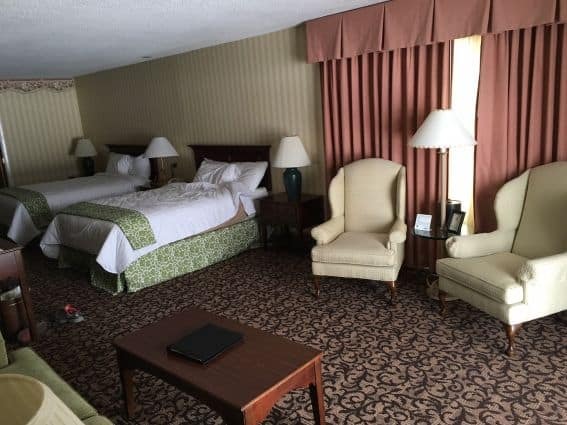 We had plenty of room to relax and sprawl out in our two queen beds, terrace room that featured a private balcony, and a stunning view of Lake Morey. We thought that one of the best “perks” of staying at this resort (in addition to the huge frozen lake) was the fact that guests can enjoy FREE skate, cross country ski, and sled rentals. Simply head over to the Skate Shop and rent whatever you’d like at no charge. They did have some really neat-looking new scooter/sled combos called KickSparks that were available for a rental charge – I’m guessing the charge is necessary due to the popularity of the item. We saw quite a few families having fun with them on the lake during our stay. Some popular winter activities at Lake Morey Resort include ice skating on the lake’s 4.5 mile skate trail, playing a game of ice hockey on one of the cleared “rink” areas, sledding, and ice fishing. Note: you need a Vermont fishing license to go ice fishing. Licenses can be purchased from a store in town. When it’s time to come back indoors after a day out on the frozen lake, you can swim in the indoor heated pool, catch a movie in the theater, play a game of pool or cards in the Card Room. We liked how the resort was very walkable and everything was easy to get to. We had a great weekend at Lake Morey Resort and the kids are already asking when we can come back! Many thanks to Devon Weaver for her assistance in writing this blog post. Devon Weaver is a deal blogging mama with a passion for traveling with her family. When she’s not blogging on MamaCheaps.com, she is enjoying time exploring places near and far with her husband and 2 kids. Disclosure – Lake Morey Resort provided complimentary lodging, meals and activity options to the Rigneys and the Weavers in order to facilitate this post. The opinions, however, are entirely their own.